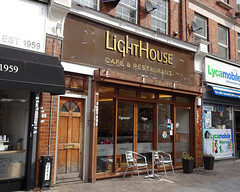 Lighthouse was a vegetarian cafe in Catford. It has now closed. As of mid-2018 the premises are occupied by a restaurant and cocktail bar called Fourteen|87. Vegetarian cafe in Catford, also catering well for vegans. It seats around 20 people on upright padded pleather chairs at dark-varnished tables, plus a couple more on a sofa at the front. The decor is in shades of cream and brown, and fairly plain aside from the light fittings — a chandelier-style arrangement in the centre of the room and swirly glass suspended shades above the service counter. A buffet station is to one side, used at lunchtimes (with options of single-plate or all-you-can-eat). Kake visited on a Wednesday morning in August 2016. There were four other customers when I arrived around 10am, and half an hour later this had doubled. No music was playing, but a loud hum was coming from somewhere (possibly the fridge, or aircon). Porridge (£2.50) photo came with a choice of honey or maple syrup. The oats were cooked a little softer than I like them, but this is just personal preference. There was just enough maple syrup to make it interesting without being too sweet, and the goji berries and pumpkin seeds added textural interest. Child-friendliness: There's a basket of toys for children, and a nappy-change table in the accessible toilet. Accessibility: A step to get in. No steps to the toilet, which is an accessible cubicle with a nappy-change table but a fairly hard-to-use lock. Last visited by Kake, August 2016. Last edited 2018-09-12 10:18:10 (version 3; diff). List all versions. Page last edited 2018-09-12 10:18:10 (version 3).